Suppression of the intraluminal blood signal is essential for visualizing arterial wall. 2D turbo spin-echo (TSE) acquisition coupled with a double inversion-recovery (DIR) preparation has been the method of choice for arterial wall imaging. 2D techniques, however, have relatively low through-plane resolution and limited coverage as compared to their 3D counterpart. Two challenges of 3D techniques include blood signal suppression and long imaging time. Recently, a motion-sensitive dephasing (MSD) preparation scheme was used for blood suppression in conjunction with 3D steady-state free precession (SSFP) acquisition . However, at 3.0 T, SSFP suffers from off-resonance artifacts. Variable-flip-angle TSE (SPACE) has been introduced as an alternative for fast imaging of carotid arterial wall at 3.0 T due to its insensitivity to field inhomogeneities . Although most intraluminal signal is suppressed due to its inherent flow spin dephasing effect, residual blood signal is often observed in regions of slow or complex flow, particularly at the carotid bifurcation. We proposed to use MSD preparation in SPACE to improve its blood suppression efficiency. MSD prepared SPACE (MSD-SPACE) sequence was created by applying two identical trapezoidal gradient pulses right before and after the first refocusing pulse (180°) in the readout, phase encoding, and slice directions (amplitude 15–25 mT/m, duration 3 ms). 2 healthy volunteers and 4 patients with carotid artery disease participated in this study at a 3.0 T system (Tim Trio, Siemens, Erlangen, Germany) using a bilateral carotid surface coil (n = 3) and a head and neck coil (n = 3). Two scans, SPACE and MSD-SPACE, were successively performed to acquire coronal 3D images with the carotid bifurcations located in the slab center. The imaging parameters included: TR/TE = 1.5 s/166 ms, ETL = 33, FOV = 160 × 110 mm2, matrix = 256 × 176, 80 0.6-mm slices, GRAPPA = 2, NEX = 2, TA = 6 min. 3D images have an isotropic resolution of 0.6 × 0.6 × 0.6 mm3. 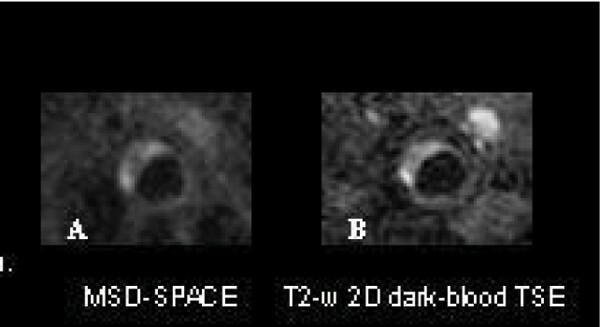 T2-w 2D dark-blood TSE images (resolution 0.5 × 0.5 × 3 mm3, NEX = 2) were also acquired for comparison. 2D images of artery cross-section were reconstructed from 3D data sets by multi-plane reconstruction (MPR). Each pair of 3D SPACE and MSD-SPACE slices at and around the bifurcation was analyzed using ImageJ (version 1.37v, NIH, USA) to measure signals of air, arterial wall, and lumen (prescribed on SPACE images). The lumen SNRs and wall-lumen CNRs were compared between the two scans, respectively, using paired student t-test. Vessel wall area at patients' plaques was calculated from 3D and 2D data sets and compared. MPR showed longitudinal view and cross-section of vessel wall (Fig. 1). Residual blood signals were observed at the bifurcation in the original SPACE images (arrows in A) which were dramatically suppressed in MSD-SPACE images (arrows in B). Compared with SPACE, MSD-SPACE lumen SNR decreased by 64% (P < 0.05, n = 6); vessel wall SNR decreased by 20% (P < 0.05, n = 6); wall-lumen CNR increased by 66% (P < 0.05, n = 6). The plaque areas measured from 2D and 3D images were similar (3% difference, P > 0.05, n = 3 patients) (Fig. 2). MPR image from a healthy volunteer. Residual blood signals in SPACE images were suppressed in MSD-space. Motion-sensitive dephasing preparation was combined with SPACE to improve dark-blood efficiency in carotid vessel wall imaging at 3.0 T. The increased wall-lumen CNR (66%) and isotropic submillimeter resolution from SPACE make this new sequence a promising technique for plaque screening. MSD preparation improved blood suppression in carotid artery wall imaging using SPACE at 3 T, resulting in substantially reduced plaque-mimicking artifacts and wall-lumen CNR improvement. MSD-SPACE achieved plaque detection comparable to T2-w dark-blood 2D TSE, but was much more time efficient (21 sec vs. 1.5 min per 3 mm-thick axial slice) and has superior through-plane resolution (0.6 mm vs. 3 mm). With isotropic resolution, the arterial wall and plaque can be visualized in any angle, particularly along the vessel axis. 3D MSD-SPACE is a promising technique for plaque screening in the carotid arteries and other regions at 3.0 T.